er begin with his $214 million contract, but shouldn't end there. Statistically, this has been his worst year since he was a young player. A legitimate argument can be made he isn't living up to his contract this season. I do see some validity in it because Fielder has to be an off-the-chart hitter to live up to his salary. He has not been that this season. There has been constant overanalyzing about his divorce, especially when he was slumping early in the season. But in truth, Fielder is having a good season by just any other standard than $214 million. His OPS has steadily risen to .824, which is in the Top 20 in MLB. He has easily topped the 100-RBI mark. His batting average isn't much lower than his career high. If he is bothered by the personal problems, it hasn't had a bearing on his play, which is predictable considering he is 29 and not battling any injury issues. 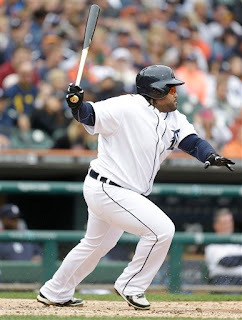 Fielder is a Hall of Fame-caliber hitter, and very limited otherwise. He isn't just going to lose the ability to hit at 29 because he is fretting about a personal issue. His 2013 story is a classic case of water finding its level. His WAR is low (1.8), but Fielder is never going to star in the world of Sabermatics. His metrics are going to lowered, like a lot of sluggers without multi-dimensional skills, because his base-running and fielding metrics are low, and he hits into a lot of double plays. But you don't have to be Tom Tango understand what you see with Fielder is exactly what you are going to get. And as the season has gone on, he has essentially produced the good part. But still, his WAR is better this season than Victor Martinez (0.8) and Torii Hunter (1.3) and you don't hear about their low metrics as much as with Fielder. The biggest factor is protecting Miguel Cabrera as much as possible. Pitching around Cabrera isn't nearly the desired option it would be were it not for Fielder, even when Martinez was batting behind him. I think the bigger issue with Fielder is the postseason. His lack of production in the postseason has been alarming. In 28 postseason games, he simply has not gotten it done .183 batting average .563 OPS), and he came up very flat in he '12 World Series (one hit). How finishes this season is particularly important and relevant than much of the angst about Fielder's "bad" year in '13. Pat I will take Prince's contract over Albert because of their age. There is nothing wrong giving a long term contract to a player in his 20s. When players are in there 30s you have to keep it short. Sure I would have like a 7 year contract but that was not going to happen. If we can move him to 1B split DH in a couple of years than I don't have a problem. If he could get in better shape that would help.There is nothing wrong hitting 280 and probably drive 110 RBIs or better. His protection for Miggy is good. I still think contracts are still going to get bigger than Prince's contract before they crash. You could potentially trade him in a couple years without getting burned.